On March 24, 2014 Mexican president Enrique Peña Nieto introduced the Ley de Telecomunicaciones y Radiodifusión (Law of Telecommincations and Broadcasting), a bill that would dramatically change the balance of power over Mexico's Internet and telecommunications ecosystem. Critics from a range of political perspectives say the law would increase state control and loosen limitations on telecommunication companies’ abilities to censor, surveil, and discriminate on their networks. The bill would impact four major areas of Mexico's telecommunications landscape: Accessibility, Privacy, Freedom of Expression, and Net Neutrality. 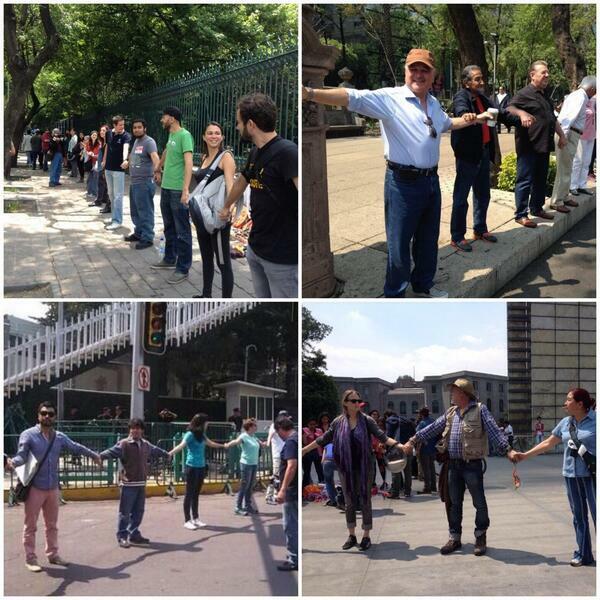 Human chain to protest #LeyTelecom, Mexico City. Photo tweeted by @Tryo1. In March 2013 the Mexican Senate accepted a petition with over 200K signatures supporting a proposed law that would ensure Mexican's the right to access the Internet. The petition discussed the public's right to information and the importance of publicly accessible points of access such as libraries and schools. Yet the #LeyTelecom bill enshrines no such rights. Instead, it frames the issue as one of market privatization and related economic interests of the telecom industry. The bill mandates that telecommunication companies retain customer data and provide real time information (including geographic GPS data) to federal security agencies, or to any public official to whom authority is delegated. This section of the law functions completely outside the judicial system, requiring no warrant or judicial oversight on data requests. The law includes no requirements on how personal data is to be protected or used once it is collected by authorities. These components of the law fall in direct opposition with the 13 Principles on Human Rights and Communications Surveillance, . Perhaps most striking is the power this bill gives to the state to block and censor communications deemed a threat to “la seguridad pública y nacional a solicitud” (public order and national security). The bill gives the government the ability to mandate telecommunications companies to temporary block or disable phone, radio, and internet connections, in areas where public protests or demonstrations are occurring. Preventing political opponents from organizing themselves is a powerful tool that many Mexican's worry will lead toward an authoritarian regime. This section of the bill also presumably allows the government to block certain websites or manipulate the internet in other ways when it sees a “national security” reason to do so. Finally, the bill explicitly allows private telcos to offer services of varying quality, speeds, and access as they see fit. These practices will almost inevitability lead to violation of net neutrality principles which keep the internet from becoming a tiered cable-like system where customers pay different prices for access to different sites and major services (like Facebook, YouTube etc) have to pay the telecom companies in order to reach telecom customers. Since the bill's introduction tens of thousands of Mexicans have mobilized to oppose the passage of this act. Headed by groups like ContingenteMX and #YoSoy132, several days of action have been planned to raise awareness and stop the bill. This fight will take place both online and on the ground. People from around the globe are encouraged to put pressure on the Mexican government not to adopt this bill. #LeyTelecom could set a dangerous precedent — and a threat to Internet freedom anywhere is a threat a Internet freedom everywhere. ContigenteMX – A good summary of the objections to the bill, with additional resources. Also check out ContigenteMX's April 21st Press Release and their letter to Congress (with international signatories). Pingback: Net Neutrality and the Global Digital Divide « What's on my mind!